Many unique items at reasonable prices - something for the whole family! Picture, shows a Civil War flag atop the 106-foot New Utrecht "Liberty Pole," flown this month in honor of Abraham Lincoln. It is one of a collection of large flags the Friends of Historic New Utrecht is putting together so as to represent all the flags the nation has known since 1783. Each flag is 12 by 18 feet. They also are used during school tours for children at the New Utrecht historic complex. Diary of a President: Supper at an Inn on 16th Ave.
BROOKLYN - George Washington was here. And he's coming back! When Washington stood next to what these days is the nation's only remaining "Liberty Pole," the year was 1790. And the flag was a "Betsy Ross," 13 stars in a circle. 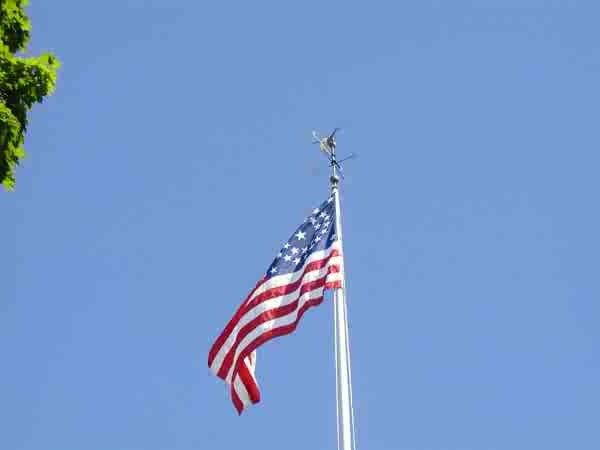 These days the flag could be one of several in the expanding collection of a historic organization with headquarters where the famous 106-foot pole is located, the New Utrecht Reformed Church in Bensonhurst. On Thursday, March 1, Washington will be back, in the person of Michael Grillo, Education Coordinator at the Van Cortlandt House Museum in the Bronx. The public is invited to a free performance of Mr. Grillo as the country's first president in the New Utrecht Parish House at 8 p.m.
Mr. Grillo has portrayed Washington for the past eight years, starting with school programs at the Purdy House in White Plains. Other appearances include those at the Morris-Jumal Mansion and Fraunces Tavern in Manhattan. Earlier in the day, he will be at New Utrecht High School where he will portray the president before about 1,200 students. That program is mainly for 4th, 5th and 6th graders from public and parochial schools. Also at the high school, an afternoon program will be held for intermediate and high school students. Supplementing the Washington performances will be a lesson plan prepared for teachers by the education committee of Friends of Historic New Utrecht. In both the evening and daytime appearances, President Washington will respond to questions from the audience. Parts of his presentation will focus on Washington's connections with Brooklyn and New York City as commander of the American Forces at the Battle of Brooklyn, which started on Aug. 22, 1776, with the landing of 15,000 British troops on the New Utrecht shore of Gravesend Bay (14th to 20th Aves. in Bath Beach). He also will recall his victorious return to New York in Nov. 1783 and his Farewell Address to his officers at Fraunces Tavern on Dec. 4 and his inauguration on April 30, 1789, in New York as the first president under the Constitution. His visit to New Utrecht, when he saw the flag on the Liberty Pole during a visit to an academy where the church now stands, was in April of 1790. According to his diary, the visit included having supper at an inn opposite the cemetery the church maintains to this day at 16th Ave. and 84th St. In past years, the Friends organization has arranged for the appearance of Abraham Lincoln as a "living history lesson" for school students and community residents interested in Brooklyn's early history. In the future, according to Friends president Robert Buonvino, it might be possible to have February-March appearances by both Lincoln and Washington. In honor of Lincoln, Friends member Robert Tycenski this month raised a 38-star Civil War flag on the flagpole on the church lawn, at 18th Ave. and 84th St. While the historians have several flags, including a "Betsy Ross," they hope the collection can be expanded further to include one representing all the flags the nation has known since 1783. That's when the first Liberty Pole was erected in the town of New Utrecht in celebration of the evacuation of the British. This is the sixth pole to be put in the same spot. "What we really would like next is a 48-star flag," Mr. Buonvino says. But, he notes, to have a 12-by-18-foot flag made is expensive. "It can cost anywhere from $400 up to $600," he said. "But, hopefully, someday we'll have all of the flags, a full set." Because seating in the Parish House is limited, persons interested in attending the night-time performance may call 1-718-256-7173 to make reservations. The fax number is 1-718-256-7162. Parking is available in the church lot. Bus and subways stops are nearby. Until Dec. 2005, the Friends' cultural-educational programs were held in the New Utrecht Reformed Church sanctuary, built in 1828. The building is undergoing a $2 million restoration and repair. The New Utrecht church itself was founded in 1677 and is part of the mainline Reformed Church in America (RCA) denomination. The American history presidents program is supported, in part, by public funds from the NYC Department of Cultural Affairs, NYC Department of Youth and Community Development and the NYS Office of Parks, Recreation, and Historic Preservation. Assistance for the New Utrecht community historical programs also has been provided by state Sen. Martin Golden and City Council member Vincent Gentile. More information on the history of Brooklyn is available at www.historicnewutrecht.org and www.newutrechtchurch.org. Contributions for restoration of the historic Brooklyn site may be sent to Friends of Historic New Utrecht, 1831 84th St. Brooklyn, NY 11214. Checks, tax deductible, may be made out to Friends of Historic New Utrecht Restoration Fund.